CES 2018: Kolibree launches world's first Augmented Reality (AR) toothbrush for kids, the Magik. Kolibree today launches Magik at CES Unveiled 2018, the kid's AR-enabled toothbrush that turns any smartphone into a game console for fighting cavities and plaque. Magik uses Augmented Reality (AR) to gamify teeth brushing with its interactive toothbrush for children. It uses fun, imaginative filters, sticker packs and more to turn a chore into a magical experience. Magik bridges the gap between oral hygiene and fun by connecting kids toothbrushes to an in-app game through advanced AR technology. Magik's app offers 15 different worlds for kids to immerse themselves in, turning the chore of getting ready for bed into a 'choose your own adventure'. The brush and app work together allowing children to hit the right spot while brushing and get rewarded with fun, interactive masks when they've brushed thoroughly. After deciding between an evening spent with pirates, a royal princess experience, or more, kids earn Magik Masks and stickers as a reward for good brushing. 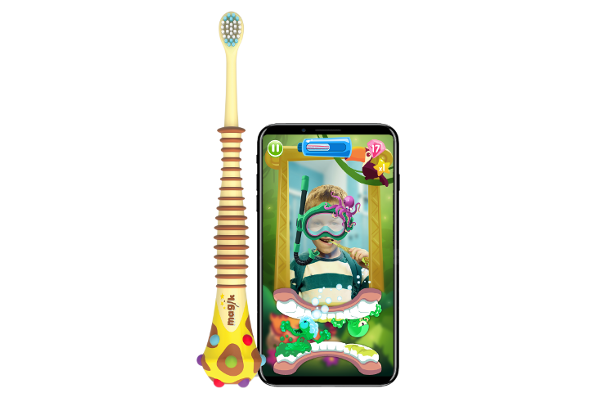 Magik's app takes brushers on wild pirate rides, or magic kingdom adventures with interactive gameplay to help kids learn healthy brushing habits. Each toothbrush uses brush tracking to detect movement and speed with sessions and feedback from within the app. Monitoring what kids are really doing in the bathroom is easy, with remote session monitoring to ensure proper brushing. With Magik's AR-enabled toothbrush, parents are able to monitor their child's progress with maintenance tracking. Magik is fun and offers guidance with its instructional brushing features, teaching kids exactly where to brush, and how long they should focus on each spot. With interactive games and monitoring dashboard guiding them to brush thoroughly, they will never miss a spot.